Ian Nepomniachtchi is the winner of the 15th Ordix Open. After a perfect start with 8 wins in a row, the 17-years old Russian could not keep the pace and lost in the penultimate round. But he showed his fighting spirit in the last round against Evgeny Bareev. With the courage of a lion he attacked his opponent and set up several cunning traps. In the end his opponent collapsed and lost on time. Pavel Eljanov and Zoltan Almasi secured 2nd and 3rd place. Best woman was European champion Kateryna Lahno with 9 points. Playing six tough rounds in the strongest rapid chess open tournament in the world is not everybody’s favourite pastime on a peaceful Sunday. And since many chess players don’t like to get up early to play chess at 10.00 AM, you could see many sleepy grandmasters and amateurs playing quick draws in the first round on Sunday to get some extra rest. But if you think getting up early to play a couple of chess games is tough, what about the triathletes who were competing in the City-Triathlon Mainz today? They started their competition at 10.00 AM as well – swimming in the Rhine, cycling and running through the city, passing the Rheingoldhalle which was packed with chess players moving pieces of wood on a chessboard. Ian “Nepo” Nepomniachtchi and Alexandra Kosteniuk were the only players who could add a full point to their perfect 5/5 Saturday score in the 6th round and they played against each other in the 7th round. Kosteniuk used a lot of time and “Nepo” parked a knight on d5 to control white’s bishop. The 17-year old Russian grandmaster outplayed his opponent and was the only one left with a perfect 7/7 score. Pavel Eljanov and Adam Horvath closely followed the sole leader with 6,5/7 and there were still many players in the Ordix sharktank with 6/7. In the last round before the lunch break, that gave the players the opportunity to watch the triathletes who were running and cycling just a few steps away from the Rheingoldhalle, several exciting games were played. On the top-20 boards only two games ended in a draw! And Nepo added another full point to his spectacular score. It was not only the amount of points he scored, but he played with the greatest of ease and blew his opponents from the board. However, there were a few more candidates for the Ordix title: Pavel Eljanov from the Ukraine had 7,5/8 and there was a group of seven players with 7/8, among them Alexandra Kosteniuk and Kateryna Lahno. After the lunch break, Zoltan Almasi and Hikaru Nakamura battled it out in a tactical slugfest. It was certainly not a perfect game, but very entertaining and worth the download. Naka seemed to win the game, was a rook up but Almasi kept his cool and won the game in the end. This was a very important win for the Hungarian, because most of the other top games ended in a draw. And finally, the leader of the pack did not win his game; Nepo had to be content with a draw against Eljanov. “Under pressure”. This song by Queen was played before the start of the penultimate round. This is an appropriate title because now it was really getting serious in the Ordix. Which player could handle the pressure? Nepomniachtchi had to play Kasimdzhanov with the black pieces and he had a good position. 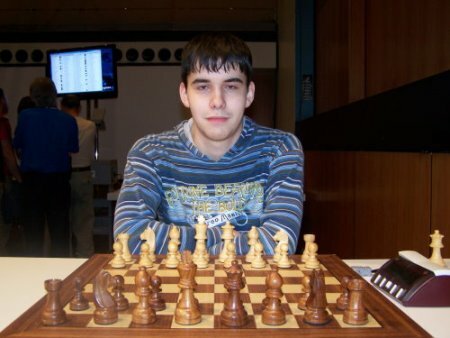 However, Kasim is a very experienced player, and has played several Ordix Open tournaments. He could slowly but steadily free himself and in the end his young opponent collapsed. On the other top board Eljanov won a very good game against Almasi and turned out to be the sole leader with 9/10! We have not reported about Evgeny Bareev yet, but this Russian star plays and wins his games quietly and in this round he won an impressive game against Markowski in only 31 moves. He had 8,5 points, just like Kateryna Lahno, who played a beautiful game against Potkin. In the final round Eljanov had to play Lahno with the black pieces. It was a difficult decision to make for Eljanov: shall I play for a win with the black pieces against Lahno, an opponent who seemed to be in great form, to secure first place alone? …Or shall I play a quick draw to secure at least a big piece of the prize fund? Lahno offered a draw after only 8 moves and Eljanov, who had a plus of 200 ELO in comparasion to his opponent, accepted. After the game, Eljanov timidly said: “I knew that only Nepo could outrun me in the last round, but I thought that he would not win his game against Bareev and therefore I accepted the draw offer.” A wrong decision! The other top board (Fressinet-Najer) also ended in a quick draw after 10 moves. Although one should not forget that the players had to play 10 tough and nerve-breaking rounds, these quick draws are horrible – for the chess fans, for the organizers and for the sponsors. During the Olympiad in Dresden and in other tournaments no draw offers before the 30th move will be accepted anymore, why not introducing this rule in Mainz next year? The people in the Rheingoldhalle wanted to see fighting chess until the very last round and this is what Ian Nepomniachtchi and Evgeny Bareev gave them. Nepo attacked his compatriot like a madman, but he seemed to be too optimistic and soon Bareev had a winning position. But the 17-year old kept pushing and set up some cunning traps. The experienced Bareev could not handle the pressure and collapsed. In a totally winning position with a piece up, he lost on time… This finale was as dramatic as the last round in the FiNet Open, in which Arkadij Naiditsch lost his final game in a completely winning position. Just like Eljanov, Nepomniachtchi scored 9,5 points, but he had a better Buchholz score and won the Ordix Open plus an invitation to the rapid chess world championship next year! His fighting spirit was rewarded.